Is this figure God, or an unjust king? This week in the lectionary, we got the opportunity to hear the the same story, the parable of the talents, from two different writers, used in two different liturgical settings. Found in both Matthew and Luke, it is a very familiar passage, and the sermon that follows is often just as common: God gives each of us gifts, and we are expected to use them for his glory. It’s a nice message, sure. But is that what Jesus is actually trying to tell us? I would like to offer an alternate interpretation for discernment. Today’s first reading from 2 Maccabees helps to frame the story in a different light. Having already tortured and killed six of a woman’s seven sons because they refused to renounce the LORD, Antiochus turned to the last son: “As the youngest brother was still alive, the king appealed to him, not with mere words, but with promises on oath, to make him rich and happy if he would abandon his ancestral customs: he would make him his Friend and entrust him with high office.” Ultimately, the youngest son declines his offer and accepts death rather than denounce his faith in the LORD; all of the money, power, and status in the world are not worth the price of supporting evil. Using this message as a foundation, I think the traditional interpretation of the parable of the talents is largely insufficient. Take, for instance, the role of the nobleman. If he is a symbol for God from whom we receive “talents,” why do his servants send ahead to say they wish him not to be king? Why does he “take up where he does not lay down,” or “harvest where he does not plant?” Why does he condemn the servent for not engaging in usury, an act clearly condemned by God in the Law? Why, just before the parable of the sheep and the goats in which Jesus rewards those who help the poor (Matthew 25:31-46), would a God figure say, “For to everyone who has, more will be given and he will grow rich; but from the one who has not, even what he has will be taken away”? These are all qualities of an unjust ruler, greedy and merciless to his people; they are not the qualities of God. When we begin to understand this, the handing over of talents is almost a perfect parallel the story of Antiochus. Wishing to further himself, the nobleman entrusts his money to three servants with the hopes that they will carry out his unjust business while he’s gone. Two of the men decide to accept the offer to take part in the unjust system, and the nobleman rewards them with money and friendship based on their profitability. But the third servant, similar to the youngest son, does nothing. He recognizes that the king is a wicked person and refuses to take part in his unjust system. Because of this, he is denied, suffers greatly, and is put to death for his insubordination. Taken together, I see the message of these passages to be that the world and God have different expectations, and it is impossible at times to follow both. The world will offer us many things, fulfill many of our temporal needs, even make us very happy and comfortable, but sometimes it will require us to compromise our faith. It’s also a reminder that truly following God is not an easy task, and that even Jesus endured suffering because he challenged the evil of the world and sought to bring justice to all. But for those who follow in his footsteps and endure the trials of the world, there is hope for redemption and just judgment in the God’s Kingdom. I offer this not as a condemnation of the common homily or the priests that give them, but rather as an alternate interpretation for prayer and discernment. Hopefully it is grounded in some truth and it may be helpful for my prayer and discernment process moving forward. Casey, I like your interpretation. Thanks for sharing it with us. WOW! Casey, I never thought of it that way. Thanks for helping me to hear in a new way today. Hi Casey, I’m sorry to say that I’m not quite getting your connection here. These seem to be two different stories with different teachings. One being that we should always use the talents God gives us to glorify Him, no matter how few our talents. The other being that no matter what, we must love God even unto the death. I think you are correct in your interpretation, Casey, and congratulation you for reaching it. It is not the common interpretation of using our talents (using the modern translation of the word) and making the most of them. This is particularly true when we mistake the rich man — who goes away for a time and then returns to demand an accounting of his servants — with Christ. I think that may be because we hear something different when we hear the word “talent” than would someone in the time of Jesus. Then, the word did not mean abilities but rather weight — a huge weight. Think tons. Some scholars say that a talent at the time would be equivalent to twenty years of wages of a common laborer. Twenty years! If someone makes $8 an hour, that’s $16,000 per year or $320,000 for twenty years. It might be worth think of talents in numbers this size, since that’s how Jesus’s audience would have heard it. The first servant was entrusted,then, with more than a million and a half dollars… and he doubled it! How could he do that? How could he make that much money in a limited period of time? As you point out, the master (who many mistakenly confuse with Christ) is called a man who “harvests where he did not sow, and gathers where he did not scatter seed.” Well, if he didn’t scatter the seed, who did? Someone who never got the chance to take in the harvest. This is a master who is living off the hard work of others. This man is an oppressor. 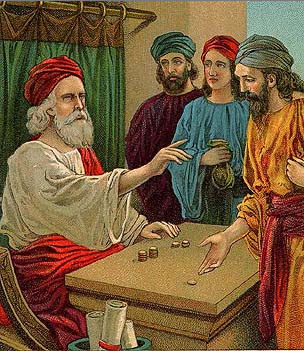 So, the first servant took the million and a half dollars and doubled it for his master. The second took a million and doubled it. The third took the $320,000 and refused to play his master’s game. He refused to harvest where he did not sow or gather where he did not scatter. For taking this stand, he was tossed out into the outer darkness, where there was “weeping and gnashing of teeth.” In other words, he was tossed out to join the other victims of the oppressors. Jesus’s audience would have heard this clearly. This is not a parable about using our abilities wisely but rather a parable about refusing to participate in oppressive undertakings. It means taking a stand, even if that means not being able to live with and among the rich. It means that taking a stand may mean having to join and live among those who are oppressed. As a Franciscan in formation, I would think that this interpretation would help you to understand more clearly the way Francis chose to live. Best wishes to you and your companions in your formation. Peace.